Greensboro was established in 1808 as the Guilford County seat on a site selected not for natural advantages but for its location at the exact geographic center. In fact, the site had disadvantages since it was in a low area covered by water with ducks swimming where the town should be built. There is a marker in Fisher Park east of Elm Steet that cites this history. Forty-two acres were purchased from Ralph Gorrell for $98 and the town was laid out in blocks of lots. Originally, it was a paper town without buildings or residents, named for a Revolutionary War hero Nathanael Greene. Growth was gradual and the first census in 1829 recorded 369 white residents, 101 slaves, 26 free blacks, five stores and three saloons. Greensboro was truly a frontier town during the early decades. Four developments before the Civil War were important in shaping the future city. First, in 1828, Henry Humphreys (the wealthiest man in town) began operating a steam-powered cotton mill north of courthouse square, the first of its kind in North Carolina. By 1833, seventy-five looms were in production, and cotton material was being exported to neighboring counties and states. Textile manufacturing took an early lead in Greensboros economic life. A second development during the 1830s was in the area of education. Religious groups established two schools that exist today. Guilford College, founded by the Quakers as New Garden Boarding School, was the first co-educational school in North Carolina. Greensboro College, chartered by the Methodists, was the first state-chartered college for women in the state. A number of influential people were associated with these institutions and those that followed  Bennett College in 1873, UNCG in 1892, and A&T in 1893. The presence of five colleges and universities has influenced the citys climate and expanded its cultural and educational opportunities. Another school outside the city also had a major impact on local residents and across the nation. Dr. Charlotte Hawkins Brown established Palmer Memorial Institute in eastern Guilford County early in the twentieth century, and it was an outstanding institution for African-American education until it closed in 1971. A third key event during the ante-bellum era related to transportation and occurred in 1856 when the first train ran over the completed tracks of the NCRR. This rail system promoted by former governor John Motley Morehead was a substitute for a river to link eastern and western portions of the state since nature hadnt provided one. It began a network of rail lines that drew the Cones to Greensboro in the 1890s, the founder of Burlington Industries in the 1930s, and the US Army in the 1940s. Both railroads and college campuses influenced the development of suburbs, as people chose to live outside the congested business district and around the colleges. Southside, with Asheboro Street as its boulevard, developed in the 1890s in southeast Greensboro, and houses in the College Hill Historic District were constructed as early as the 1840s. A final early occurrence with future implications was the Underground Railroad, a system of people and routes used during the era of slavery to help people escape from the South. A local Quaker Vestal Coffin is often cited as the President of the URR, but this was truly a folk movement that cannot be traced to one place or person. The cooperation of local blacks and whites in this effort was certainly an influence on our history. The Civil War ended the first phase of Greensboros development and provides some interesting observations about the town. The war also contributes to another theme for our history. Just as Nathanael Greene chose the area in 1781 to fight the British, Confederate General Joseph E. Johnston selected the town as an appropriate place to engage General Sherman in battle in 1865. It was Lees surrender at Appomattox on April 9 that made this fight unnecessary. During the spring of 1865 and the following time of Union occupation, the presence of large military troops dominated town life. Greensboro emerged from the Civil War eager to move ahead and welcomed newcomers from the north, eager for their capital and skills. Thanks to northern Quakers, freed blacks began the neighborhood of Warnersville, south of Lee Street and west of Elm. The pioneer black churches, St. Matthews UM, St. James Presbyterian, Providence Baptist, and Bethel AME, had their beginning there, as did Bennett College. New businesses during the Reconstruction era included tobacco manufacturing, lumber and furniture plants, and foundries for metal products. 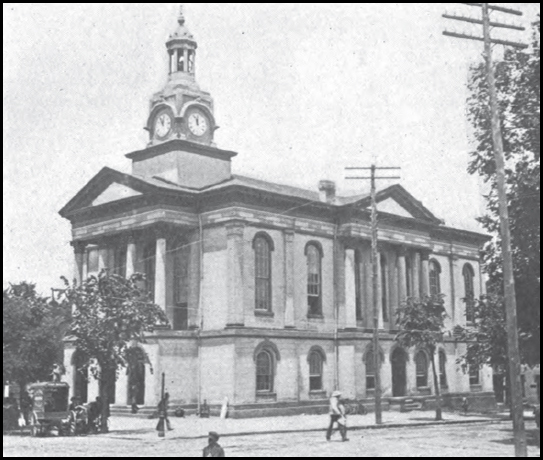 Greensboro even had a law school in the 1870s and 1880s. During the 1880s, one company organized to successfully use local clay for terra cotta pipe, and one failed to convert iron into steel. The failure of the iron company, located in northeast Greensboro, provided a partially developed area for the Cone brothers who arrived in the next decade. By 1891, there were sixteen major manufacturing plants in the city. Railroad development continued and there were lines running east to west, north to south, southeast to northwest, and west to Winston. The arrival and departure of sixty trains a day gave Greensboro its nickname the Gate City in 1891. Click Here for information on the three (3) known "Street Railways" that operated in Greensboro from 1891 to 1934. Early in the twentieth century tension between Greensboro and its neighbor High Point developed because the two were locked into one county with one county seat. To make the situation worse, it was a four-hour trip between the two. In 1910, High Point with a population of 9000+ attempted to secede from Guilford County by having the General Assembly create a new county with it as the county seat. The bill was defeated by a floor vote in the General Assembly, but the issue would arise at other times. To ease the situation a modern highway, known to us as the High Point Road, was constructed in 1916. An early twentieth century movement by the cities of the Triad (Greensboro, High Point, and Winston-Salem) to obtain one of Americas new airmail routes also eased tension. Since Winston-Salem was the largest city in NC at the time, it seemed the likely site. Then, in 1923, High Point surprised Greensboro by an annexation that expanded its population to 21,000 and made it NCs sixth-largest city. Greensboro was number eight, and its backers immediately submitted a new charter to the General Assembly, increasing its limits from four to nearly eighteen square miles. Its population more than doubled to 45,000+. "Greater Greensboro" as it was known became NCs third-largest city overnight, a rank it holds today. The 1920s brought modern buildings downtown with the Jefferson Building, a 2.5 million-dollar investment, as the focal point. It was our only skyscraper for many years, and when Will Rogers visited Greensboro he said that local citizens were as proud of the one building on its skyline as parents are of a babys first tooth. With the growth of Jefferson Standard and Pilot Life, insurance joined textiles and education as a major industry, and many referred to Greensboro as the "Hartford of the South." Real estate development was also important in this decade, and new neighborhoods included Westerwood, Lake Daniels, Sunset Hills, Hamilton Lakes, and Latham Park. The development of Sedgefield hinted that Greensboro and High Point would eventually merge. The question of an airmail route and supporting field was decided in the 1920s when land west of Greensboro was selected over a Winston-Salem tract, and that city withdrew from the Tri-City Airport Commission. Leaders to keep our airport strong included E. B. Jeffress in the 1920s, Caesar Cone II from 1941 until his death, and Stanley Frank after 1968. A new railroad station and an airfield were reasons for bragging in 1927, and new buildings included the Carolina Theatre, Aycock Auditorium at UNCG, and the King Cotton Hotel. In the 1940s, Greensboro had 60,000 residents. Cone Mills was the worlds largest denim maker, Burlington was the world leader in rayon weaving, Blue Bell was Americas leader in overalls manufacturing, and Guilford Mills had begun production. During the decade, Greensboro was selected by the government as a regional mail hub and by Sears as a regional catalog center. During World War II, a major training camp, later a replacement depot, was located within the city on a large tract of land in northeast Greensboro. More than 300,000 men and women, black and white, went through this army facility between 1943 and 1946. At the end of the war ORD, as it was called, became a major business incubator. Political changes following the war included the election of the first female to City Council in 1949 and the first African-American in 1951. Juliette Dwiggins served two years and retired, but Dr. William Hampton was reelected in 1953, earning the second-largest number of votes, and went on to serve on the city school board before his death in 1960. In the 1950s, Lorillard Tobacco and Western Electric expanded the manufacturing base, and Moses H. Cone Memorial Hospital opened as a modern, regional medical center. All of these developments drew more people to the city. The 1950s also brought additional annexations to the city, the first public housing units, expanded public recreation, including the Coliseum, a downtown revitalization committee, and a new airport. These were major changes for the developing city. The annexation of 1957 brought the town of Hamilton Lakes into the city, as well as Bessemer. Public housing complexes included Smith Homes for whites and Morningside Homes, site of the Klan-Nazi shootout, for blacks. The creation of the Coliseum is a complicated story dating back to 1938 when the idea of a civic auditorium surfaced; the projects history includes the rejection of three sites and two bond issues before a 1956 bond proposal locating the facility at the old fairground passes. The building was completed and dedicated in 1959 as a memorial to the soldiers who died in WWII and Korea. In the 1960s, Greensboros transportation network was greatly improved by the Wendover Avenue project that cost $12.5 million and was the most-expensive road project in NCs history. Downtown declined, however, with the sit-ins of 1960 and civil rights protests in 1963 and 1968-9. Urban redevelopment included new buildings in the 60s and 70s, including the parking decks, but shopping centers like Four Seasons and Carolina Circle led to downtowns decline as a retail center. Redevelopment also erased the neighborhood fabric in east Greensboro along Market Street and triggered preservationists who had been slow to organize in Greensboro. Preservation successes include Blandwood and the 1918 county courthouse. In the 1970s, Greensboro peacefully integrated its school system and the plan was cited around the nation for its success, but the decade ended on a negative note with the Klan-Nazi confrontation with CWP members and bystanders. Five people were killed and televised footage was shown across the nation. Although six Klansmen were tried for the murders, they were acquitted, an action that many people did not understand. The 1980s brought downtown revitalization with four new skyscrapers and the listing of the downtown district on the National Register of Historic Places. Another development in the political arena came with the 1982 move to district elections for city council. Outside the city, a new airport terminal was completed in 1982 and the facility was renamed Piedmont Triad International Airport in 1987. Some of the successes of the 1990s include the new public library and the childrens museum, the Historical Museums neighbors on Church Street. On Elm Street, we have a developing theatre district with the Broach and the new Triad Stage Company. Still under consideration is the creation of the International Civil Rights Museum in the former Woolworths store. Greensboro was granted a U.S. Post Office on September 4, 1810, and its first Postmaster was Robert Johnson. The name was changed to Greensborough in 1858, and back to Greensboro in 1893. The Post Office as been in continuous operation ever since inception. Click Here to view several maps of the city of Greensboro provided by the State Highway Commission / DOT.